Things I Like: Who You Callin' Tart? Is anyone jealous that this is what I'm having for dinner tonight? I'm so excited for delicious veggie tart I can barely contain myself! I'm on the email distribution list for the 20 Minute Supper Club and the pictures alone make me want to turn myself into Gilbert's Mom. 1. Preheat oven to 425 F. Unroll puff pastry, remove paper, cut in half and transfer to a parchment paper-lined sheet pan. Set aside. 2. In a food processor, chop garlic, scraping down sides of bowl. Add fresh herbs, pine nuts, goat cheese and 1/3 cup oil and process until combined. Spread mixture evenly over pastry, leaving a 1/2-inch border on all sides. 3. In a bowl, combine vegetables with remaining oil and season with salt and pepper. Arrange vegetables like this on pastry: 4 asparagus pieces, 3 zucchini quarters and a row of cherry tomatoes. Repeat three times for each tart. 4. Bake 20 minutes or until golden. 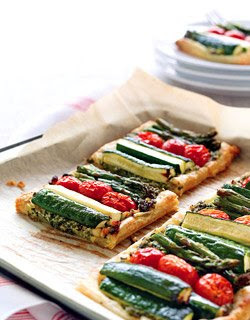 Remove from oven and cut each tart into three servings (in between zucchini and asparagus). Serve with green salad.